Of course you all knew I would get here eventually. Bill Bryson is one of my very favorite people in the whole world, and I love just about everything writes. 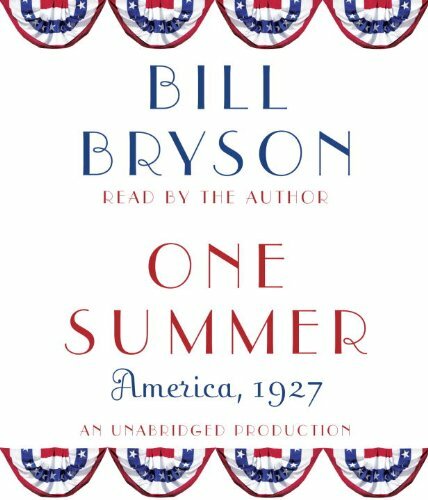 As usual, I got an audio edition of his latest book, One Summer: America, 1927 and enjoyed his narration. Bryson tells the many stories of what went on in the United States in the summer of 1927, as the title suggests. He mostly chronicles aviation and how Charles Lindbergh's flight across the Atlantic sparked off this huge reaction around the world, but he also talks about Babe Ruth and his record-breaking 60 home runs in a season, Al Capone, Sacco and Vanzetti, Prohibition, Calvin Coolidge, Herbert Hoover, various sensationalized murders, and lots of other things. A lot happened that summer. And that was part of the problem with the book, I think. There is TOO much going on. If I am going to read anything about history, I'd rather have Bryson write it, but the sheer amount of information in here made it difficult to keep everyone straight, especially since I was listening. I would often find myself wondering who he was talking about. That said, this made it easy for me to turn off and back on again without feeling like I needed to know what was going to happen next. Bryson has this conversational tone that makes me feel like I'm hanging out with a very interesting and very smart friend. That's why I love his books, and that's why I will continue to buy them so long as he keeps writing them. He can make anything interesting, and I know a lot more now about the 1920s than I did before, that's for sure. Disclosure: I bought this audiobook. Got this for my husband for his birthday, he hasn't read it yet. I just read this book last week, and was so entertained I kept reading whole pages out loud to my husband. Even with no context, he found the passages so entertaining that he's reading the book now that I'm done with it. Love Bill Bryson! I love Bill Bryson, looking forward to reading this. Thanks for sharing.